On February 21, 2018, the world lost a great man. Reverend Billy Graham died at age 99, heading, at long last, to his eternal home with Jesus after serving our Lord so well and for so long here on earth. He touched so many lives with the Gospel. In fact, Billy Graham inspired Chip and Joanna Gaines so greatly in their faith, you could say it helped make them who they are today! 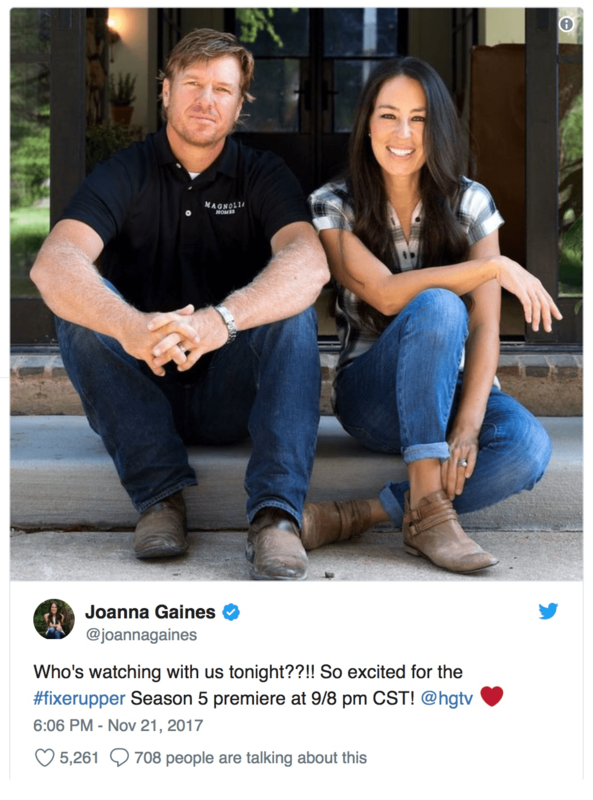 ... you know there’s something quite different about the husband and wife duo Chip and Joanna Gaines. That “something special” caused millions of viewers to fall in love with the down-to-earth couple who seem to succeed in just about anything and everything they do. Now, clearly, these are two very talented people. But there’s way more than talent behind their prosperity. The secret to Chip and Joanna Gaines’ success boils down to one thing — their faith. And the flames of that faith have been fueled and fanned over the years by Spirit-driven teachers. Great teachers like the Reverend Billy Graham. "The impact that man has had on my life is immeasurable," Chip said. Chip’s journey with Jesus started in 1975 at a Billy Graham Crusade building when he was just a one-year-old ginger baby. That night, Chip’s mother Gayle rededicated her life to Christ and became serious about her faith. And as Chip grew older, God continued to use the work of Billy Graham to pour into his life. Chip attended college with Billy Graham’s grandchildren, and when he spent a week at their home, it was their father, Danny Lotz, who began to take Chip under his wing. Danny discipled and mentored Chip, teaching him how to live more like Christ. If it weren’t for this strong foundation of faith, the Gaines’ story may have gone very differently. But because Billy Graham inspired Chip and Joanna Gaines so deeply, they were ready when it came time to follow God’s call for their lives. Years after Chip’s discipleship with Billy Graham’s family, Chip and Joanna were married and pregnant with their second baby. They owned a furnishing store called Magnolia Market, but they were sensing God telling them to trust Him and close the store to focus on raising their family. Joanna wasn’t sure about the future, but she was obedient, and as she closed the doors to their store she felt like her dreams were closing with it. Ironically, that’s when the peace of God overwhelmed her, and He reminded her to trust Him with her dreams. God made the plans for her life, and they were better than what she could imagine. At just the right time, a production company heard about Chip and Joanna’s home renovation business, paving the way for their hit show, Fixer Upper. And the rest, as they say, is history! Now, with their fifth child on the way, Chip and Joanna are again feeling the call to focus on their family. The announcement that the fifth season of Fixer Upper would also be its final season left many fans broken-hearted. 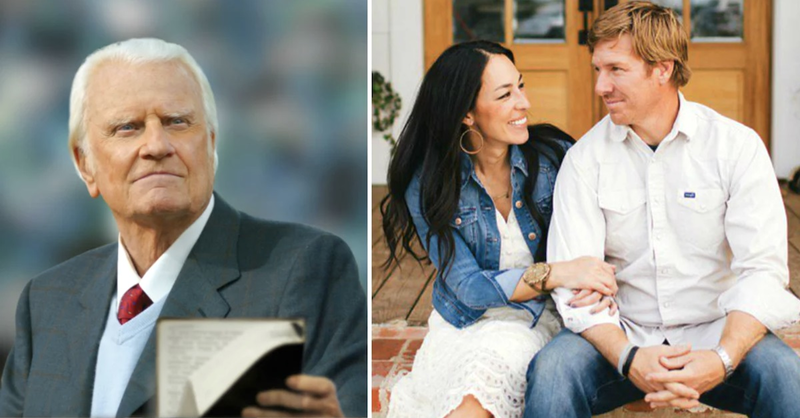 But since Billy Graham inspired Chip and Joanna Gaines in remaining faithful, they know this is just the next step in the Almighty’s bigger plan. And they are trusting Him to lead. For many, the fame and success the Gaines have received could easily turn into a pitfall, turning the focus to worldly possessions and accomplishments. But Billy Graham inspired Chip and Joanna Gaines to build a foundation on Jesus. "Heaven is where Jesus is and I am going to Him soon!" Originally appeared on GodUpdates.com. See the article in full here.